This is just another number for many but for people who those who follow Spanish football closely, it is much more. Barcelona and Real Madrid are now tied at 95 El Clasico wins in competitive matches. The two heavyweights have already clashed three times this season and the fourth one is just around the corner. In the last two games, Real Madrid have clearly had the upper hand over the Blaugrana. But however good Real Madrid have been, Barcelona have just been too stubborn to lose. 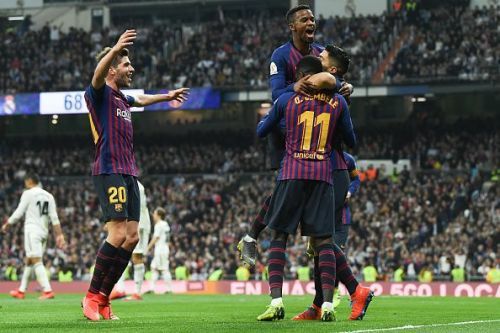 Even when the Blaugrana were backed up in the corner at Bernabeu, they held their defense tight with some good goalkeeping from Marc Andre ter Stegen and good anticipation of crosses. Vinicius Junior ran riot, Sergio Reguilon busted the left side open, but even then Real Madrid drew a blank against Barcelona. Barcelona, on the other hand, did not play according to their philosophy. Defensive play has never been associated with the club but it was a stubborn back line that was desperate to progress through to the final for a sixth time in a row. Ernesto Valverde has come under severe criticism for his style of management, but he has managed to turn this team into a group that can dig results out. Lionel Messi was poor, Madrid dominated, the crowd was psyching the Barcelona players out of the game, not necessarily with friendly chants; yet the Blaugrana came out with not one, not two, but three goals. If we talk in terms of MMA, Real Madrid won the first leg of the Copa Del Rey by decision, and they lost the second leg by TKO while leading on the judges' scorecards. So going into the weekend Clasico, what can we expect? Luis Suarez was taken off in the 78th minute which made it clear that Valverde wanted his striker to have some rest for the game on Saturday. FC Barcelona are one lucky side. Lionel Messi came and walked on the pitch as if it was a training session, and still, Barca won. So, Messi is still very fresh for the Clasico. On the other hand, Madrid players would completely exhausted from the fixture. Vinicius worked really hard, along with Modric, Kroos, Reguilon, Varane and almost every other Madrid player. They used up everything in their tank to get to the finals and they didn't. That hurts mentally and physically, too. We expect Barcelona to go in with the same 4-3-3 formation that Valverde is sticking to for quite a while now. There might be Arthur's imminent inclusion in the midfield and perhaps Umtiti also. The good thing about Arthur's inclusion is that Barcelona would get the press resistance and creativity that he offers. He was arguably the best midfielder in both the Clasicos that he played this season. Valverde might also consider Coutinho in case he decides to rest Suarez. If so, we can see a lot of tactical tweaks - Dembele on the right, Messi at false-nine, Coutinho in the left wing. Santiago Solari has also stuck to the 4-3-3 formation but the problems are plenty for him. Does he start the out-of-favor Bale or the already exhausted Vinicius? Does he keep playing Vazquez, who had no significant impact against both Girona and Levante, down the right? One thing in Solari's mind is rotations and unfortunately, he cannot rest Varane due to Nacho's suspension. Playing a full-fledged XI will result in tired players against the lethal and flourishing Ajax team. Solari's biggest problem is that he doesn't start Isco, ever. A creative attacking midfielder who should be starting every game didn't even get into the squad against Barcelona in the Copa Del Rey. Other than his arrogance or stubborn attitude of excluding Isco, he has done well in bringing the youngsters into the team. El Clasico never disappoints, never. It has been ages since the game has been scoreless so we can expect goals, especially due to the fact that both teams played a competitive match just three days before. Predictions never work in the El Clasico but here it is. We expect Barcelona to get the victory against Real Madrid. Real Madrid just cannot press and attack at the rate they did in the Copa Del Rey if they want to be 100% ahead of the UCL game, because not everyone can be a part of rotations. Finishing is one of the bigger concerns for them, as Benzema and Vinicius missed easy one-v-one chances against ter Stegen last time out, as well. Barcelona are more confident and more energetic coming into the game, they have Lionel Messi, they have momentum. The goalscorers would be Luis Suarez and Lionel Messi, as both players have scored in the last three league Clasicos they have featured in. We also choose to stick with the same scoreline that unfolded on Wednesday night. LaLiga: When did Real Madrid and Barcelona last finish outside the top 4?